This summer, thousands of young people will be receiving their A level results, and starting a course at college or university. Some will be packing their bags to study at the other end of the country, or even abroad; others will be commuting to a local university, perhaps studying part-time or juggling their course with a job. If you’re a new student, it’s an exciting time. You’re stepping out into the world as an adult, learning new things, making new friends. But it can be an anxious time, too. What if the course is harder than I thought? Can I survive on my student loan? Will I like my classmates? Freshers’ Week (called Welcome Week or Induction Week at some universities) can come as a shock. You may feel under pressure to sign up to every society, go to every party, or try every strange new drink that you’re offered. You don’t have to say “Yes” to everything. Be yourself. The advice that I always offer to new students is, “Don’t Panic.” There may be difficult moments when you begin your student life, but there are people around to help. Your college or university should allocate you a personal tutor, who will be the first point of contact – so make sure you know who your tutor is, and where to find them if you’re in need of advice. The Student Union is there to help you. If you have special needs or a disability, there are professionals around to make sure that you get the most out of your course – so don’t be afraid to ask. The Church is there for you, too. At every institution, there is a Catholic chaplain, who may be a priest, a religious sister or brother, or a lay person. The chaplain is there for you: there to listen, to support and not to judge. The Catholic Chaplaincy will offer a Sunday Mass, with music and preaching geared to students. There will often be talks and discussion groups, to get you thinking about your faith and respond to your questions. There may be days away or a weekend retreat, as well as opportunities to get involved with the local community through the St Vincent de Paul Society, or to tackle issues of justice and peace in a CAFOD group. 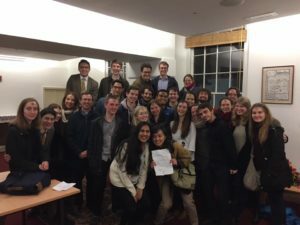 Usually, the students themselves organise social events through the Catholic Society, which can include anything from film nights to football. You might not know it, but the word “Catholic” actually means “universal.” The Catholic Church is a universal church – there are Catholics in every part of the world, and the Catholic Chaplaincy at Durham University welcomes students from many countries. One of the most rewarding parts of my ministry as a chaplain is seeing friendship blossom between students from widely different backgrounds. I have learned so much from the students I meet, and from hearing about their different experiences of the Church – and I’ve sampled food from many countries. The most important thing about the Catholic Chaplaincy is that it’s a safe space, where everyone is welcome, You can be yourself, without having to pretend. If you have doubts or questions about faith, you can get some honest answers. If you want to live out your faith in an authentic way, you can meet others who share the same desire. After thirteen years of Catholic school, you may be dying to get out into the wider world. But, when you do get to university or college, you might discover that the values that you learned at home and school are worth holding on to. The support of a Catholic community could start to seem important. So, before the start of term, why not spend five minutes doing a Google search for your university or college chaplaincy? You can find contact details for all chaplaincies in England and Wales at www.catholicsatuniversity.org.uk Give it a try!